When moving into a new house, some paint the walls of different rooms a certain colour to achieve a particular effect. Study rooms are usually painted with blue because it’s a calm colour, and red is avoided because it evokes strong emotions. Evidently, colours can affect our emotional state of mind, and to put this in a wider context, so can our surroundings. 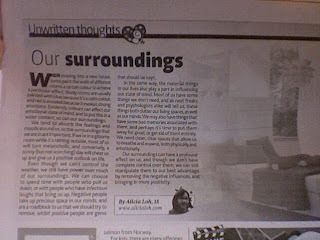 We tend to absorb the feelings and moods around us, so the surroundings that we are in are important. If we’re in a gloomy room while it’s raining outside, most of us will turn melancholic, and conversely, a sunny (but not scorching) day will cheer us up and give us a positive outlook on life. Even though we can’t control the weather, we still have power over much of our surroundings. We can choose to spend time with people who pull us down, or with people who have infectious laughs that bring us up. Negative people take up precious space in our minds, and are a roadblock to us that we should try to remove, whilst positive people are gems that should be kept. In the same way, the material things in our lives also play a part in influencing our state of mind. Most of us have some things we don’t need, and as neat freaks and psychologists alike will tell us, these things both clutter our living spaces, as well as our minds. We may also have things that have some bad memories associated with them, and perhaps it’s time to put them away for good, or get rid of them entirely. We need clean, clear spaces that allow us to breathe and expand, both physically and emotionally. Our surroundings can have a profound effect on us, and though we don’t have complete control over them, we can still manipulate them to our best advantage by removing the negative influences, and bringing in more positivity. P.S. Yes, I'm still alive.